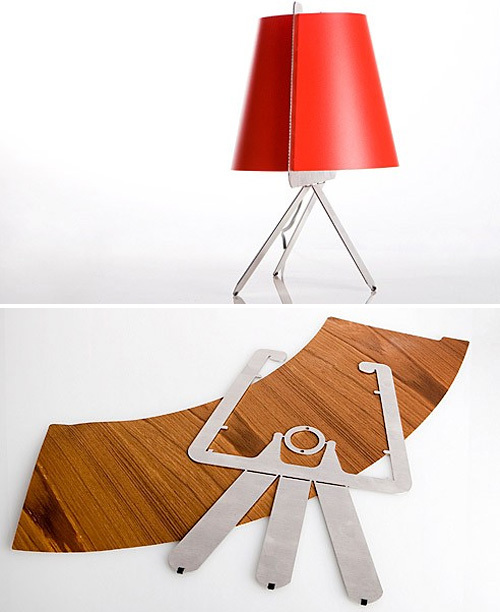 Flat Packed Lamp Doesn't Come From You Know Where | OhGizmo! Though it will arrive at your home packed completely flat, this appropriately named Flat Lamp has no affiliation with a certain Swedish furniture and accessories store. Made of stainless steel and veneer polypropylene, the lamp can be converted from 2D to 3D in minutes, and the only thing you’ll need to add is electricity and a light bulb. It’s available in dark veneer, light veneer, red and white finishes from gSelect for $72. Well, at least when it catches fire it won't give off toxins. Polypro is pretty clean burning and dripping. So basically you pay $70 for a bunch of metal and plastic veneer so that you can then assemble it, and then find you need to provide all the electrical components yourself and have to go back out and spend another $15-20 on that.. I think not.